City Mill Vice President Carol Ai May and President Steven Ai, a sister and brother who run the City Mill chain of eight hardware stores on Oahu. Like most fine print, the tiny black lettering etched on Steven Ai's bright yellow name tag is often overlooked. His title may be the only thing that sets him apart as he whisks through the aisles of the Honolulu City Mill store, stopping to help a customer casually perusing plastic storage containers last week. That may be why few describe company President Steven Ai and younger sister Carol Ai May -- the third generation of their family to run the Oahu home-improvement chain -- as anything less than down to earth. "Steven always says that he's the least important person in this organization," said Carol, City Mill's vice president. "I am," Steven said. "I'm gone for two weeks and nobody knows I'm gone. A cashier doesn't show up, and 15 minutes after, people are running around looking for someone to run the register." In Steven's office, tucked away on the side of the flagship Nimitz Highway store, a sentence scrawled in blue marker on a white board reads: "People resist change because they think they can't do better." No words may be truer for a company that has weathered the arrival of three large mainland competitors to remain in business for nearly 110 years. "I'm a much better person both at work as well as at home just because of their wisdom," said company operations manager Tim Hatfield, who has worked with Steven and Carol since 1996. "They really pride themselves on sharing with other people so they can grow as well." 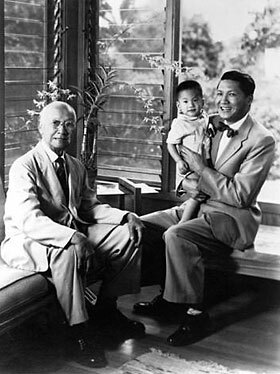 Three generations of the Ai family -- Chung Kun Ai, left, David Ai, right and Steven Ai. 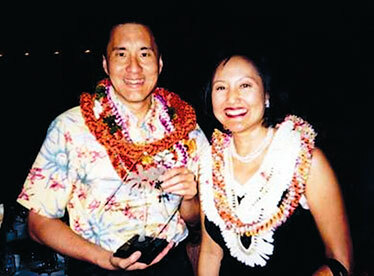 Steven Ai and Carol Ai May at the Business Leadership Awards in 2003. "We have the same goals and we never really fought growing up," Carol said. "I don't know that there's really anyone who could say that they've seen us ever fight." Steven Ai thumbs through a pile of some dozen bright yellow cards stacked on the corner of his tidy office desk. "A person in Kaimuki was very gracious and tried to help me start my car." "James is a good cashier." "Outstanding service. I like the great attitude." Steven reads them all -- the customer report cards he not-so-lightly dubs as the barometer of City Mill, the Oahu home-improvement business founded by his grandfather nearly 110 years ago. He has run the company for 16 years with younger sister Carol Ai May. Together they weathered the arrival of three mainland-based home improvement retailers, standardized store operations and revamped hiring to emphasize attitude over skill. As Carol says, "You can't make a crabby person happy." The duo runs the 480-employee company from the same 1950s-era headquarters of their father, David C. Ai, and grandfather, Chung Kun Ai, who opened a lumberyard there in 1916. The 60,000-square-foot Nimitz Highway flagship store plays host to a small swatch of offices, nearly lost behind the paint section save a side-door entrance, where customers filter in and out to pay bills or apply for jobs. Dozens of awards, dried leis and faded newspaper clippings create a sort of makeshift corporate timeline on the walls, dotted with photographs of family and employees. "We want this to be a happy fun place to work," Carol said. "We want to be a professional organization, but we want to have a family environment." Job satisfaction has risen to an 11-year high of 92 percent, based on internal employee surveys, Steven says, landing City Mill a spot this month as one of Hawaii Business Magazine's best places to work. The company's reward program allows workers to accumulate points to earn $250 gift certificates as well as safety and attendance bonuses. Little things help too, Steven says, like a surprise pizza party or $30 grocery coupon at the holidays. "They really make sure that it is family-based and close-knit," said Pearl City store manager Charlie Nakama, who started at City Mill as a part-time customer associate 15 years ago. "Steven and Carol have given me so many opportunities not only to move up within this company, they also helped me with my family." After Nakama was promoted to a supplies receiver, he took six months off to stay at Stanford University, where his 6-month-old daughter was receiving a liver transplant. "They never once made me feel as if what I was doing was wrong," he said. "They backed me 100 percent. I met a few families up there that they were just blown away." 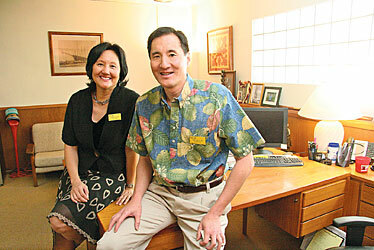 The road to third-generation company executive started in the lumberyard and at the cash register during summers off from Iolani School, for Steven, and Punahou, for Carol, who also worked at JCPenney and Saks Fifth Avenue as a teenager. 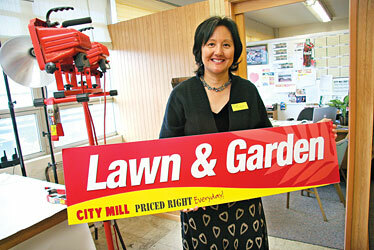 City Mill Vice President Carol Ai May last week displayed a new store sign design, which debuts this month. "One of the first projects my dad gave me is 'We need a store in Hawaii Kai and we need a store in Mililani. Go find something,' " she said. "I didn't know anything about real estate. Still don't, but I sort of made that happen." "Being a female in a Chinese family, there wasn't a lot of expectations for me to be in the family business," Carol said. "The pressure was all on this guy. I'm going to say the pressure was heavy, heavy pressure. Not just pressure." Carol attended Scripps College in Claremont, Calif., before transferring to Tufts University in Boston to study marketing. She worked in advertising, including managing the TWA Airlines account in New York, and returned to the isles, where she bought Hawaii's Own, a marketer of frozen tropical juices. She then sold the business and returned to City Mill in 1989 to "do jobs that don't have any homes," so she could care for her two children, now 23 and 21, at home. "One of the first projects my dad gave me is 'We need a store in Hawaii Kai and we need a store in Mililani. Go find something,' " she said. "I didn't know anything about real estate. Still don't, but I sort of made that happen." She was joined in 1992 by Steven, who studied business administration at Whittier College in Southern California, and attended graduate school at University of Denver. He returned to work for his father for five years before working in New York for an accounting and consulting firm. "Just because you are part of a family business doesn't mean you can waltz right in there," he said. "We've worked for others, got promotions and been on our own. There's a self-confidence that you can do it and also there's a confidence in your limitations." Carol has guidelines for a potential fourth generation of family ownership: Her children must first finish college and graduate school, work and be promoted at an outside company and have an appreciation for family business, among other things. When her oldest son was working summers at City Mill as a teenager, he overheard employees say, "'See that guy over there -- he is going to be our boss someday,' " Carol said. "So they kind of get it just from the environment. I just tone that down." Carol and Steven's grandfather, Chung Kun Ai, founded City Mill in 1899 as a Chinatown lumber importing and rice milling business. He sailed to Hawaii 20 years earlier from China, where he now has a street in his namesake. The company survived setbacks including several fires, financial panic and a failed sideline pineapple business, Honolulu Fruit Co. In his office, Steven displays a sepia-toned photograph of his grandfather along with the Vigilant, a five-masted schooner he commissioned in 1920 to carry lumber from the Pacific Northwest. The duo agrees that research and adaptation have helped keep City Mill's eight stores alive, as larger mainland home-improvement stores such as Atlanta-based Home Depot Inc. and Eagle Hardware & Garden Inc., bought by Wilkesboro, N.C.-based Lowe's Cos. in 1999, have opened stores in the state. "I remember saying to Steven, what makes us think we are so smart that we are going to beat this?" Carol said. "Fortunately, some of those big boxes came a little bit later and we were able to follow what some of the more successful home centers were doing on the mainland." The company decided not to go "toe-to-toe" with the mainland-based stores, but instead expand their product offerings in areas including home organization, Carol said. Last week she announced the launch of Simply Organized, a 12,000-square-foot home-storage store, at the Crossroads at Kapolei Shopping Center. It is the first major expansion in a decade for City Mill. "Humility is very important," Carol said. "Both of us know because of our prior business experience outside of our family business, if for some reason, we are on the street with nothing, we can make a living by ourselves."